Fans of roulette looking for something a bit different will most likely enjoy playing this Hot Properties game. If you are a fan of the board game, this is definitely a great roulette game to try out. 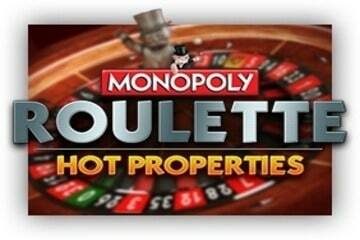 Monopoly Roulette Hot Properties can be enjoyed on both mobile devices and desktop setups, no app or software required. There isn’t a board game more popular than Monopoly - although probably surpassed by modern tabletop games in terms of gameplay, Monopoly will remain in history as an entertainment sensation that has been around for over 80 years now. Roulette, on the other hand has been around for centuries, and remains as one of the classics of the casino suite. Now, imagine mixing those two together! The creative people down at SG Interactive have created a compelling game called Monopoly Roulette Hot Properties - it’s got a Monopoly theme, European rules and a Hot Properties Bonus Game, so it’s like a twist on the old tale and a great refreshment for the current roulette audience. The same basic gameplay structure as classic European roulette applies in the game of Monopoly Roulette Hot Properties. The betting table is within standard and there is a special racing track for call bets. The wheel has 38 pockets in total; there are 36 numbers evenly divided into red and black slots, one special pocket marked with zero and one extra pocket which is the Hot Properties pocket. All of the chip denominations are Monopoly money, which is a nice touch. Instead of regular roulette chips you’ll be playing with values of 0.01, 0.05, 0.20, 1, 5, 20, 100 and 500. As in every roulette game, there is a ball spun around the wheel. The betting options include Straight up (36x win), Split (18x win), Street (12x win), Corner (9x win), Six line (6x win), Dozen (3x win), Column (3x win), 1 to 18 or 19 to 36 (2x win), Odd or Even (2x win), Red or Black (2x win), Voisins, Tiers and Orphelis. Once the players have made their bets, they can hit the spin button to start the wheel. The ball will land in one of the pockets and the winning bets will be paid out, whereas the lost ones will be removed from the table. Each player will have the opportunity to re-bet the same bet, or get back to the table and make different choices. The hype revolves around the special Hot Properties bonus game incorporated into the Monopoly Roulette gameplay. The only way to trigger the Hot Properties bonus is to place a bet on the yellow Hot Properties pocket. When the ball lands on the yellow slot, the player gets transported into the side bonus game where he/she gets to play a version of a version of Deal or No Deal, Monopoly style. What More is There to Know About Monopoly Roulette Hot Properties? In the Hot Properties bonus game, the players are required to select 5 of a total of 18 hidden properties from the Monopoly Board, you know - Mayfair, Old Kent Road and so forth. The ones chosen will be removed. The players will then decide if they want to continue with discarding properties or if they want to accept the prize money offered by banker Uncle Pennybags. So basically, the round can end in the player taking on the offer, or with him/her keeping whatever the last property is worth. The graphics and interface of Monopoly Roulette Hot Properties are superb; the bonus game does an outstanding job of introducing more excitement to the base game and even though one needs to work hard for triggering it, it’s worthwhile when activated. Top Video Poker, Table Games and More!